Perhaps you’re wondering, "What could possibly be left to say about the L.A. County Fair since last year's Trippy Food/Deep End Dining joint podcast extravaganza?” Seriously, can it get any better than watching a cow eat the placenta of her newly calved offspring? I dare say, "Nay! ", but after my recent visit to this year's fair, either we were fighting off a deep-fried food induced coma and slept through a decent amount of the exhibits or the Fair is ramping up their game. At FairView Farms' Big Red Barn (where Bessie's now-famous all-you-can-eat afterbirth buffet took place), staff members were letting children milk a goat that was nonchalantly grazing on some hay with its head in a vise-like contraption, while puff-ball feather-footed Brahma chickens ran around in a nearby pen. I took the opportunity to try to get answers to a couple of my most nagging livestock questions: can humans drink pig milk, and can you eat the female parts of a cow? Well, O Best Beloved, I received conflicting answers on the first question and a resounding, "You betcha!" on the second, so I decided to get my mind off critter eating briefly and check out the garden area behind the barn sponsored by McKinley's Grill, who uses the fruits and vegetables grown there at their restaurant located at the Sheraton Fairplex Hotel. My obsessive curiosity was working a double shift, and I asked one of the gardeners what two of the flowers were - one was a dainty, periwinkle blue flower that almost looked like a daisy, and the other was a dead, dry lacey flower similar to Queen Anne's lace (both were on stalks about 4 feet tall). Well, roll me in peanuts and call me Goober, it turns out the blue flower was lettuce and the dead stalk was a carrot. Apparently the vegetables send out a flowering stalk (referred to as "bolting") in order to seed; in the case of the lettuce, once this occurs the leaves become bitter. On the other side of the barn, Cindi (of Cindi's Curds and Whey) was demonstrating the manufacture of cheese curds, cream cheese, butter and ice cream, all made in small batches by hand. Cindi (whose surname is not Muffett as one would suspect) had a Mason jar handy containing a yellow lump surrounded in white fluid; this was described not as the results of my lab tests, but as the successful manufacture of small-batch, hand-churned butter. 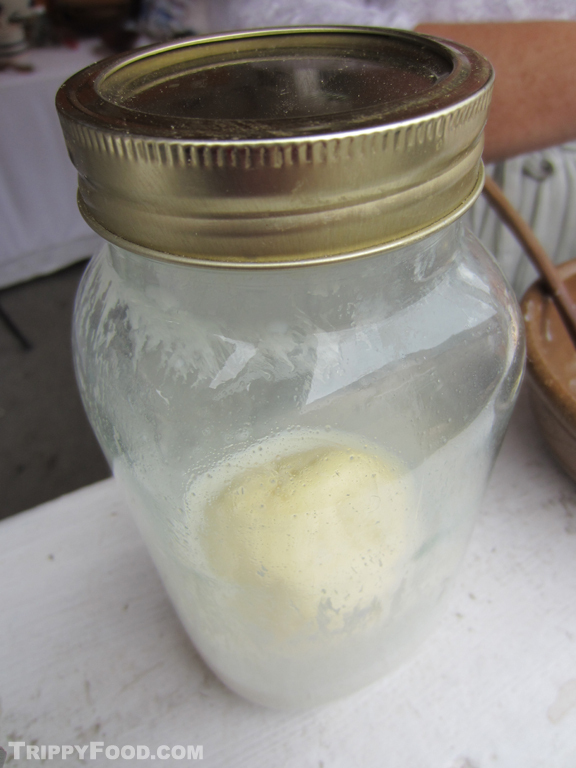 Her method is simple - fill a jar with fresh cream (and it doesn't get much fresher than straight out of the cow), tightly seal the lid and shake vigorously for at least half an hour. According to Cindi, once you stop hearing the sloshing, you have whipped cream; when you start to hear thumping, that's when the butter starts forming. 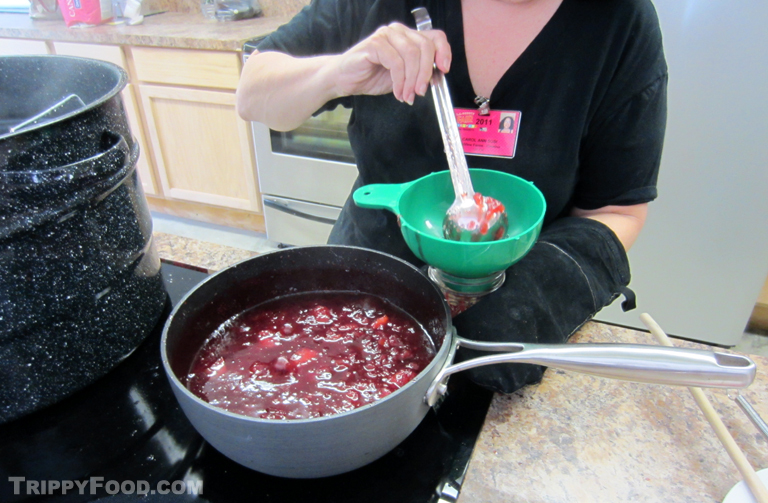 Nearby, Carol Ann Susi was doing a demonstration on canning preserves, in this case plums. Once skinned and cut, the fruit was white in color, but when cooked down with sugar added, it once again attained its natural purple color. One pavilion contained aisles and rows of competition winners that in addition to displaying the winners of the canning competition featured the best of sugar art (think marzipan), homemade wines and beer, textiles and traditional art. The Marketplace is devoted to competition and production of hand-crafted beer and wine, including the award-winning beers from the Los Angeles International Commercial Beer Competition. No PBR and Two-Buck Chuck on tap here - the vibe in the hall was like someone took the Temecula Valley Balloon & Wine Festival and the Munich Oktoberfest and shoehorned them into one building. In addition to displaying and providing samples of the award-winning brews, there is gourmet food (such as pork belly pizza) available to complement your selection - would you care for a nice Schloss Reinhartshausen Riesling to bring out the sweetness of that corn dog, ma'am? One of the areas I believe to be new to the 2011 fair is the Celtic Village; in addition to being able to purchase Celtic crafts and goods you can get your fill of fish and chips, corned beef or bangers and mash or just kick back and dance a little jig to the strains of the Celtic bands performing. 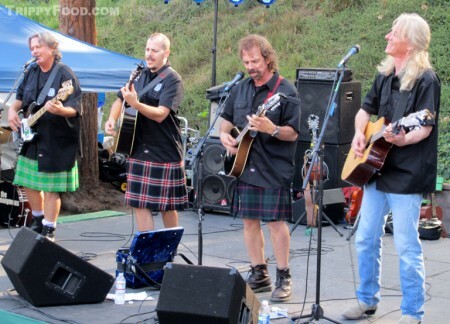 Mackinnon's Kilts had a sale rack of some fine wraps, and I considered acquiring one but felt that with my red dragon shirt on I'd look a little like Guy Fieri attending a Catholic school for girls. A nearby Australian Outback didn't quite have the same level of energy; aside from a couple of caged, screaming kookaburras and some wallabies, kangaroos and emus in a big pen, there was some Aussie enthusiasm lacking that the late, great Steve Irwin could have greatly enhanced. An area called Wilderness Ridge features a lumberjack competition (although from what I saw it looked like they were trying to see who could sleep the longest) and cage with huge, feisty bears (unfortunately California was under-represented as the bears in question turned out to be European brown bears, probably a wise choice since although watching handlers being mauled by grizzlies has a higher entertainment value, it would have ruined little Timmy's appetite for funnel cakes). Just past Wilderness Ridge sit the historic trains maintained by the Railway and Locomotive Historical Society; the area is anchored by a relocated 1887 Santa Fe Railroad station depot from Arcadia and featuring numerous old locomotives, cabooses, and other railway cars that fairgoers - the engineers will even let you blow the engine's steam whistle. 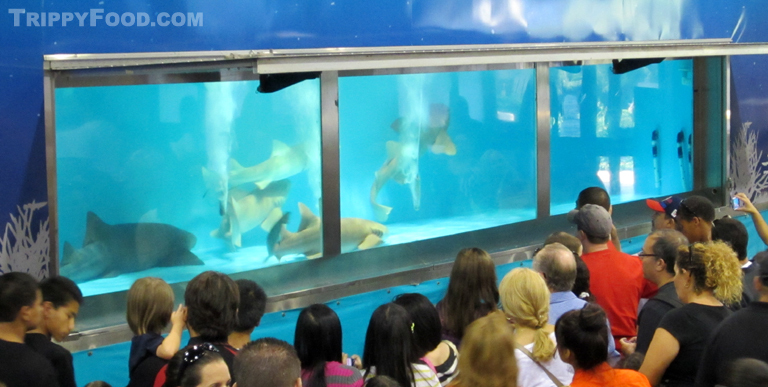 This year's big draw is the Shark Encounter exhibit; four full grown nurse sharks and a lemon shark are encased in a huge tank into which the loudest, most obnoxious kid is plunged after being smeared in calves' blood. 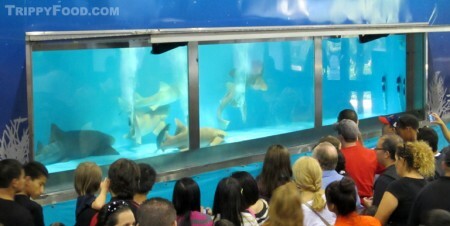 I'm probably making the last part up, but large crowds gather in front of the tank while people enter the tank to get personal with the carnivorous fish. If fake carnivores are more your speed, there's always the hall of animatronic dinosaurs whose repetitive, jerky motions couldn't frighten Don Knotts, but there's a nice tie-in at the end where kids get to handle live animals that are hold-overs from the Cretaceous period. By this point the thought of voracious, flesh-eating monsters devouring everything is site was putting a fire in my belly, a ranging inferno that could only be quenched by fair fare. As much as I coveted the prized meat scepter known as the turkey leg, it was going to have to take a back seat to the more exotic offerings once comes to expect from the county fair. The ubiquitous Chicken Charlie's had a separate billboard to showcase this year's artery-clogging dish to be topped - deep-fried Kool-Aid. Imagine a Dunkin Munchkin permeated with strawberry Kool-Aid and lightly dusted with Kool-Aid powder - as the pitcher-shaped man once said, "Oh yeah!" Having sampled these crimson dough globes at the OC Fair, I can attest to their good grades on the flavor scale, but I was saving the room in my gut for new conquests, the first of which was provided at a booth simply labeled "BBQ Oysters". 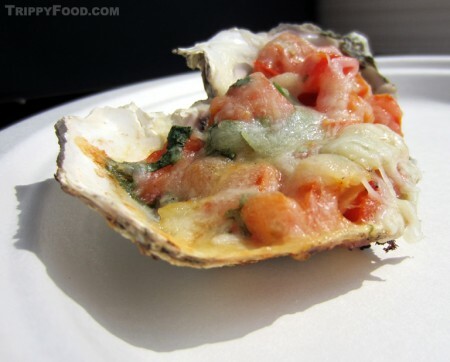 Although I've had backyard grilled oysters with fresh butter and Gilroy garlic, as well as BBQ oysters (at the Farm House Restaurant in Olema, CA), I've never experienced what this vendor called "Mexican-style" oysters, grilled and topped with pico de gallo and shredded queso fresco. I tend to shy away from topping oysters with things that hide mollusks of dubious origin, but the pico and cheese added a fresh and unique flavor, like a roasted campechana. 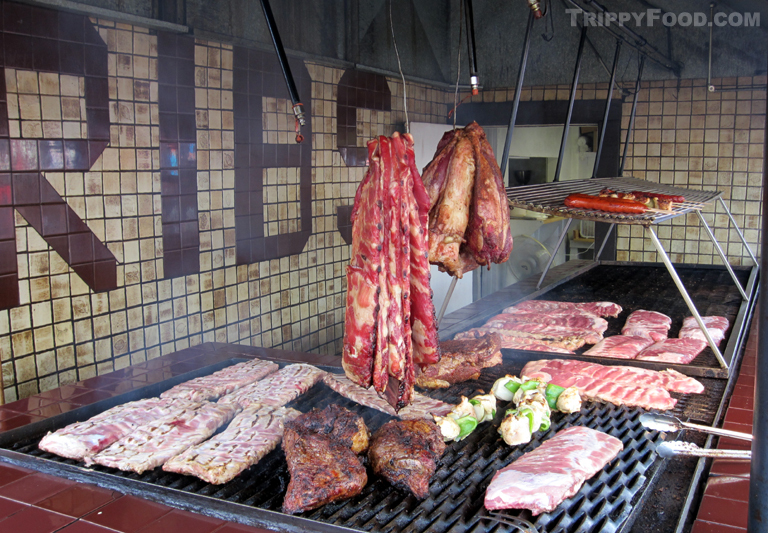 At Big Bubba's BBQ, what looked like a big, flat wok was perched atop a grill with the contents identified as Cowboy Potatoes. While a quick examination of said Cowboy potatoes did not immediately reveal the inclusion of ground or otherwise prepared cowboy, it occurred to me that a cowboy would most likely just throw a potato on the fire and then fish it out and eat it. This steel saucer was filled with thick slices of "skin-on" potatoes and liberally topped with chopped onion, bell pepper and unidentified spices and wading in a shallow pool of oil. While they looked tasty, this looked like a dish that required immediate consumption lest the oil congeal into an unflattering glaze. One of the well-crafted oil submersibles available at the fair can be found at The Ranch's otherwise unassuming stand, an underground Southern favorite advertised by a sign which cryptically reads, "Fried Dills". Deep fried pickles have the dubious quality of a high enough moisture content that the batter separates from the pickle, yet The Ranch has not only managed to create a fried dill spear that retains its coating, but does so deliciously - the light, crispy batter is almost like a panko coating, itself containing dill. 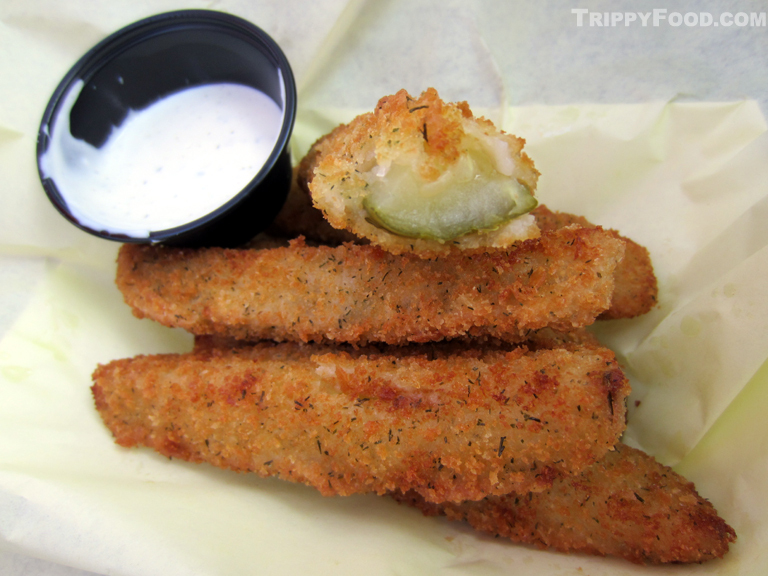 The fried pickle bites off cleanly, isn't greasy and maintains the taste of the pickle, but as a word of caution, give it a few minutes to cool down or you may end up with a deep fried palate. 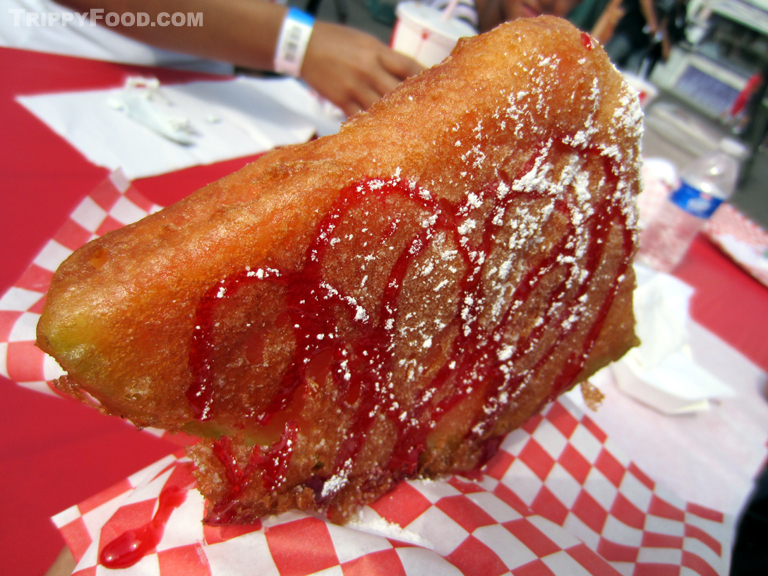 The corn dog has long been a staple of county fairs, but Juicy's has elevated the battered hot dog on a stick to new heights (or more accurately, greater lengths). Their Cowabunga Corn Dog weighs in at over a foot in length; I believe this behemoth could be brandished as a deadly weapon or alternately be used as a marital aid. Naturally there is a plethora of deep fried this and that-on-a-stick, but I was in the market for something from the wild side of the canola cornucopia. I almost didn't give Cardinali Wood Fire Pizza a second look, after all there were no fewer than twenty large signs that advertised their specialty, including one for the world's largest fair food (their pizza oven-sized Mambo Italiano), another Man vs. Food challenge in the vein of the Big Texan's 5 pound steak - if you don't finish it, you're going home broke. Up at the top of the booth (almost as an afterthought) was a sign that simply read, "Deep Fried Watermelon on a Stick". I was curious strictly from a physics standpoint - how were they proposing keeping the batter on an item that's 92 percent water? I don't know how they did it (I'd rather keep it a mystery), but the DFWOAS was outstanding - it was warm and sweet inside, with the watermelon's delicate flesh in a semi-melted state, while the spongy batter clung to the fruit without disintegrating all over my hands. A light drizzle of fruit syrup and dusting of powdered sugar finished it perfectly; my only disappointment was that the heat from the fryer didn't render the rind in an edible state. Cardinali's hidden gem is unequivocally the most refreshing deep fried item I've ever consumed. 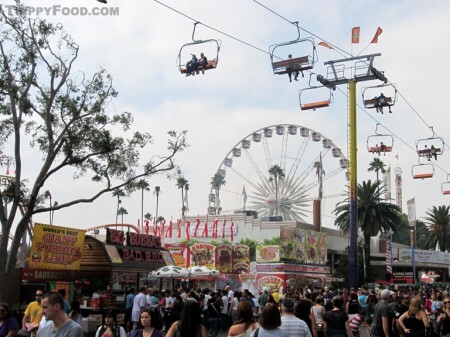 NOTE: Admission to the L.A. County Fair was provided by organizer of the event, who did not in any way influence the content of this article. This entry was posted in Trippy Happenings (Events) and tagged BBQ oysters, Berlin Brats, Big Bubba's BBQ, Big Red Barn, Brahma chicken, butter, CA, California, Call to Post, canning, Cardinali Wood Fire Pizza, Carol Ann Susi, Celtic Village, cheese, Chicken Charlie's, Chris Biro, Cindi's Curds and Whey, Clare Graham, corn dog, cow, cowboy potatoes, cream, cream cheese, curds, deep-fried, dinosaurs, Fairplex, Fairplex Park Racetrack, FairView Farms, flea circus, horse racing, ice cream, Juicy's, King Taco, Kool-Aid, L.A., LA, Liberty Wings, Los Angeles County Fair, Los Angeles International Commercial Beer Competition, macaw, Mackinnon's Kilts, McKinley's Grill, MONA, MorYork Gallery, Osvaldo Orellana, Pinks, pirate, pizza, placenta, Plaza de las Americas, Ploughboys, plums, Pomona, preserves, Railway and Locomotive Historical Society, Shark Encounter, sharks, trains, turkey leg, watermelon on a stick, Wilderness Ridge. Bookmark the permalink. You missed an unusual opportunity to do a article about Chris Biro, the pirate who performed The Pirate’s Parrot Show at the LA County Fair this year. I agree with you, Chris, but there was too much to take in to focus on one thing – I’m sure I neglected a bunch of great acts and sights. I caught some of your show with one of the blue macaws and the crowd gathered round seemed to really enjoy it. For now folks can see you with the macaw in the gallery photos in this post, but get in touch with me at val@trippyfood.com and maybe we can do a separate article, as I’m interested in what you’re doing at Liberty Wings.